I decided to take the day off today and was rewarded with thunderstorms this morning so I sat in and watched the USA v Ghana game. I would've loved to have seen the Americans win, which would have seen them progress, but despite plenty of possession they didn't have the craft or skill to unlock the Ghana defence and the African's were generally just quicker to the ball in midfield. 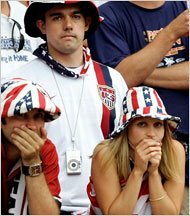 The introduction of Eddie Johnson was too late and although Brian McBride headed against the post, the toughest 1st round group proved too much for the team jokingly rated 5th in the world. The American's I feel did have good reason to bemoan some awful refereeing during their last two games. Referee Markus Merk was far too whistle happy, gave a suspect penalty and missed another flailing elbow, when Eddie Lewis had to go off with a cut. But it was the Czech game that did for them, and it was more of a shock after that performance to see them also finish up on the plane home. It puts England's 'poor start' into perspective doesn't it? I don't know what the media and people here will make of the USA's exit from the world's greatest sporting competition. Tonight Jay Leno joked about American's finally withdrawing their people from foreign lands but one thing that was a joke, was ESPN's insistence on showing about 70 people standing in Times Square watching the game on a big screen! Christ, you would have more people crowded around a black and white portable in a village in Ghana than that!